There are plenty of electric lawn mowers on the market - but which ones are the best? A good rule of thumb is to go by the best selling products - who's buying what. Whatever the product, if it isn't up to scratch, it's not going to sell. It's highly unlikely anyone is going to throw a load of cash at a substantial purchase such as a lawn mower unless someone else is buying it. We need to know what it does, what it doesn't do and how much value for our money we're going to receive. Whether you're after a walk behind lawn mower or something for a larger lawn area, such as a ride on model, better you choose the most suitable one for your needs. I've reviewed the top five best sellers, and having owned most of them over the years, I've got a good insight into what makes them work. Unsurprisingly, the best lawn mowers are headed with a Black and Decker model right off the bat. The MM875 Lawn Hog 19-Inch 12 amp Electric Mulching Mower with Rear Bag is the best seller and between the trusted brand name and the fact that it makes mowing the lawn a lot easier, it's an understandable winner. The MM875 is an electric mower, built to last and work hard. It's designed to cut, collect the clippings and will also mulch the grass if you leave the bag off. With its decent 12 amp motor, it will make short work of various lawn types and the ability to adjust the base height is a required handy aspect. A great all rounder, the MM875 is worth the outlay - a recommended buy. A nice example of what a cordless lawn mower should be is the Earthwise 60120 20-Inch 24-Volt. It's touted as an eco-friendly model which it is - but all electric mowers are. Still, it is a fact and the Earthwise is a capable machine. It works off a 24 volt battery, which gives it plenty of kick. Like the previous model, this one will cut, collect and as you power along. It possesses a solid 20 inch cutting deck, that will cut a good sized path through the lawn. Generally, the wider the deck, the less passes you'll have to do to get the lawn in order. One of it's more attractive features is the fact that the height adjustment is a one stop lever, situated on the handle. No more back bending and wheel fiddling. It's strong, powerful and contains enough juice from one charge to clear a good sized lawn. Buy it? That would be a yes. A great mower, made to make your life easier. Cheap lawn mower aren't easy to come by, but the Sun Joe MJ401E-RM 14-Inch 12 Amp Electric Mow Joe is an exception. This is a used, reconditioned model that will set you back less than $100. 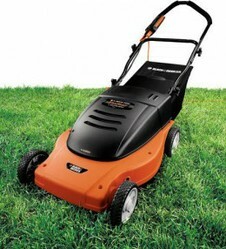 It's got a throaty 12 amp motor with a 14 inch cutting deck - making this a great buy for small to medium sized lawns. Don't expect to take it out of the box and feel as though you've got an untamed beast in your hands. The Mow Joe is lightweight, which makes it better for those looking for something that they can ably handle, rather than feel they're having to struggle with. That doesn't mean it won't do its job - it will. It's also virtually maintenance free, possesses push button control and comes with a highly rated customer service back-up. A nice, lawn friendly mower. The Black & Decker LM175 18-Inch 6-1/2 Amp is another example of a rotary lawn mower. It's also more towards a lightweight mower, despite its pretty generous 18" cutting deck. It's a reliable model, easy to control and use and great for most sized lawns - despite its weight. As always, it will cut, collect and mulch, depending on whether you want to compost the clippings or use them as fertilizer. This is one to buy for those looking for a brand new lawn mower, as you do get a lot of bang for your buck. It's a Black and Decker, you know it's going to work straight out the box and it's quiet, eco-friendly and a breeze to operate. Don't be put off by the fact that it's corded - it's not that hard to keep an eye on the cord whilst in motion. And if the cord isn't long enough - simply buying an extension power chord will combat the problem. Electric lawn mowers put some people off due to the cord - so here's another cordless example. The Black & Decker CM1836 18-Inch 36-Volt Cordless allows you to get on with your lawn care efforts worry free. It's got all the usual tricks and toys expected of the brand name, including the cut, collect and mulch features, as well as a simply key-start operation and a one touch wheel height adjustment. Should you buy it? If you want a gutsy lawn mower that's going to cut a nice path through your lawn, will handle easily and work off one charge, then yes, you should. It's quiet, user friendly and solid in its build. A great mower for the environmentally conscious buyers, more so due to the fact that it possesses an ENERGY STAR® rating. A worthy purchase.